The charming, pre-modernized streets of France. 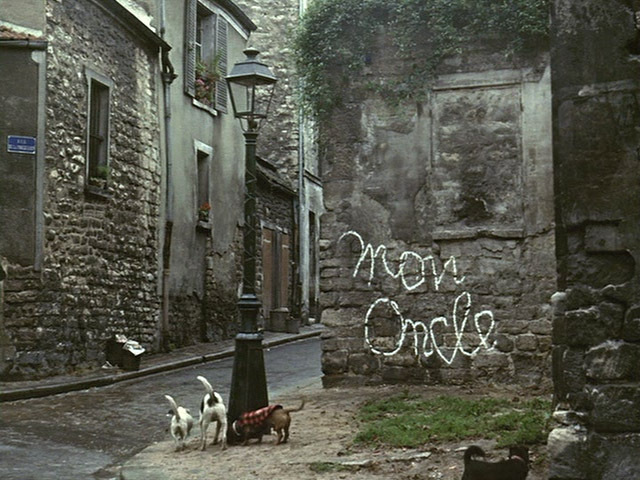 In the list of most beautiful comedies, Mon Oncle may very well steal first place. This is simply one of the most imaginative, feel-good films I have ever seen. It is not only a feast of ingenious physical comedy, but it is also a statement against modernization and its overwhelming subsequent effects. Now, usually, when I watch a comedy, I do not expect an abstract philosophical observation. If I do expect something of that sort, I usually enter the viewing a bit wary. But this satire is brilliantly executed; the statement is wrapped up in good-hearted humor, sublime music, and fantastic set pieces (all of which I’ll explain in detail below). Jacques Tati, the film’s writer, director, producer, and starring actor, is often regarded as France’s comedy master. An obvious precursor to Rowan Atkinson’s memorable Mr. Bean character, Jacques Tati created the unforgettable Monsieur Hulot: a bumbling, lovable, trench coat-wearing fellow who causes accidental catastrophe as he tries to mold to the ever-changing modern world. 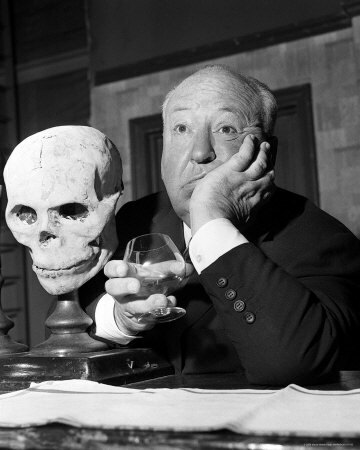 After his first feature film, Jour de Fete in 1949 (in which Tati played Francois, not Hulot), the Monsieur Hulot series started in 1953 with Les Vacances de Monsieur Hulot, and continued with Mon Oncle, PlayTime (1967), and Trafic (1971). In Mon Oncle, the statement about modernization is instantly evident. The credits appear on signs at a construction site. The sounds of the engines of various construction vehicles are almost unbearably loud and obnoxious–then comes the antithesis. The film switches immediately from the loud, raw atmosphere of the construction site to an quaint, unmolested French neighborhood. The contrast is beautiful and sad; it forces one to realize that, although modernization has led to several inventions that are beneficial to mankind, too much modernist reconstruction can lead to the loss of meaning for existence. If this was the sole purpose of the movie, it would perhaps be quite a drag. But this is not the case. This statement is not presented in the stark, dramatic form one would expect, but rather in a superbly choreographed comedy of errors. Tati, as Monsieur Hulot, is endearing and hilarious, conducting himself with silent whimsy and subtle naivete. His smile is sweet and sad, especially near the end of the film, and his awkward way of walking is absurd yet irreplaceable. No one can recreate Hulot. Jacques Tati, to put it simply, IS Monsieur Hulot. Inseperable and one. Now, for the sets. Mon Oncle boasts some of the most brilliant, fantastic set pieces ever made for a film. The only sets I can think of that would rival the Arpel family’s ultra-modern abode are the buildings (made expressly for the film) in Tati’s PlayTime (1967) and the apartment complex in Rear Window (1954). As if this movie marvel wasn’t enough, Hulot’s own apartment building is one of the most beautiful, unbelievable film sets ever made. These are phenomena which mere words cannot effectively describe; they must be seen. To hear the score of Mon Oncle is to have your heart warmed. The gently plinking piano is soon accompanied by a quintessentially French accordion. The visual partners to this piece are shots of mischievous canines rummaging their way through trashcans (the crashing of the can’s lid is synchronized with the music, and acts as a brief drum solo), and eventually moving from the lovely, unadorned streets of Old France to the coldly modern neighborhoods, where we meet the Arpel family and their neoteric residence. On a side note… For those who prefer newer comedy, I will say that the sight gags in Mon Oncle rival those in, say, Airplane (1980) and Hot Shots! (1991). They’re not as blatant, no, but (in my opinion) just as funny. If you want to feel good, watch this movie. I will warn you, this film does not belong to the “Instant Gratification” class of comedy. The jokes are subtle; the humor is in the whole. That said, it is possibly the most heartwarming movie (to me) that I have ever seen. It helps us to remember that “old-fashioned” is not a dirty word. The Arpel family is the epitome of ultra-modern. Their house is a fully automated, avant-garde, highly polished prison–that is, to their son, Gerard. He does not enjoy living in this glimmering steel cage; thus, he spends most of his time with his uncle, Monsieur Hulot, who leads a simpler existence than Gerard’s parents. However, Gerard’s parents believe the naive Hulot to be a bad influence on young Gerard. Thus, they attempt to make Hulot one of their own. Monsieur Arpel gets Hulot a job at his plastic factory, and Madame Arpel hosts a garden party (one of the funniest scenes in film history) in attempts to mold the bumbling Hulot into a person of order and class. After many failed attempts, the Arpels seem to have given up. But Monsieur Hulot may have a more positive effect on them than they’d like to think. Music by Alain Romans, Franck Barcellini, Norbert Glanzberg (uncredited).